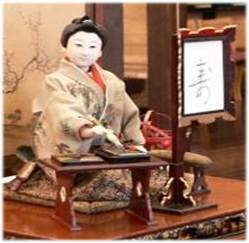 The automaton by Toshiba’s founder Hisashige Tanaka is really something, considering that it was built in 1820. A fully mechanical machine that is able to draw four complex Chinese characters (kanji) thanks to a sophisticated mechanism and then give a brief nod of satisfaction once the writing is completed. The mechanism itself is enough to be impressive. The achievement resides in writing those beautiful characters, right? Right? According to Morinosuke Kawaguchi, the true genius of Tanaka lies elsewhere. After a closer look at the mechanism it becomes apparent that out of the total of 12 strings of the automaton, only 3 (!) are used to actually draw the characters. The other 9 are used for what seems to be a minor detail in the entire process: the nod of satisfaction of a job well done. In this attention to detail, Tanaka did not only master the engineer’s part of how to make an automaton that was able to neatly draw four Chinese characters. He also added the emotional gesture that makes the automaton much more akin to a miniature human than a mechanical device. Tanaka was an egineer and designer at the same time. He knew how to build an automaton, but also envisioned what it should perform on the functional as well as emotional level. In this respect, the function of writing Chinese characters is the first glance function, but it would have been an incomplete, reptitive and machine-like design without the human gesture. As machines take over the manufacturing process, the human’s role is more and more reduced to that of the designer. It is the “What to make” that is required today, says Kawaguchi.